The Food and Agriculture Organization of the United Nations has invited application for the post of Monitoring and Reporting, Data Management System and Remote sensing and GIS. Interested and qualified candidates will find the post descriptions from our website www.fao.org/fao-in-bangladesh/employmentprocurement/en/. Interested applicants aer requested to send their Personal Profile From (PPF) or Personal History From (PHF) to the following address: FAOBD-Vacancies@fao.org by close of business on 08 & 09 May 2017. Women candidates are encouraged to apply. 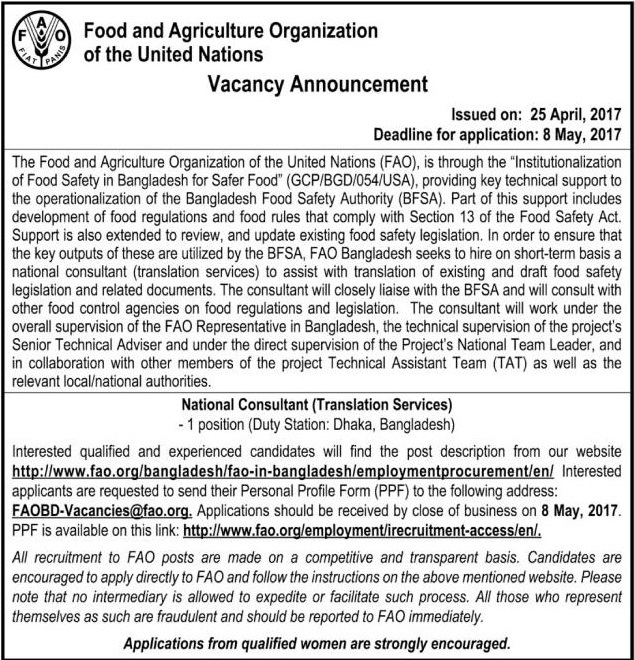 Food & Agriculture Organization of the United Nations-FAO Job Circular 2017 offer to people for exciting career opportunities in private sector. Food & Agriculture Organization of the United Nations Job company think that young and energetic people is the key to success in this sector that create brightness in our country. Otherwise, Food & Agriculture Organization of the help’s us to social economy. 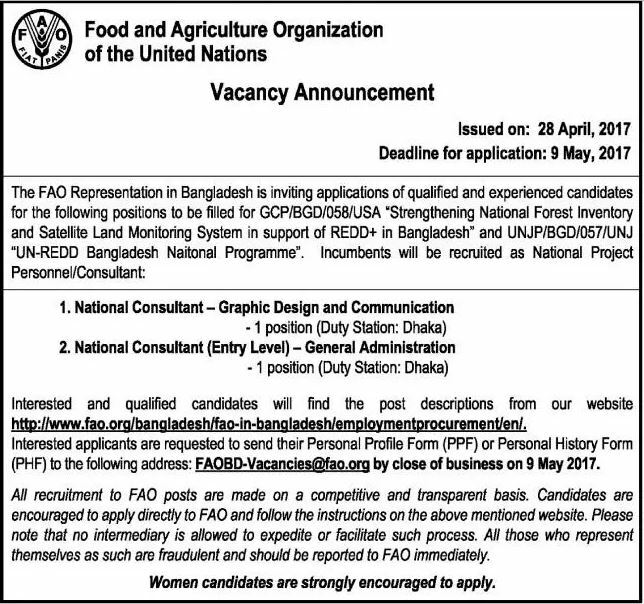 If you want to apply for FAO Job Circular 2017, you should submit your application within 08 & 09 May 2017. Food & Agriculture Organization of the United Nations- FAO Job Circular 2017 converted to an image file,so that everyone can read easily or download this job circular. Food & Agriculture Organization of the United Nations Job Circular 2017 has been given bellow.